Climate management is going to be essential to improve the efficiency and cost of renewable energy and enable rapid decarbonisation of world’s energy generation systems to avoid catastrophic climate change. Ultimately control of our regional weather will be the solution to our greatest problems. I was making the point that primeval life began changing our planets climate almost from its very first existence and that man as a recent incarnation in evolution has been significantly effecting the climate since we first hunted species to extinction and started cutting down huge swaths of forest to convert to agricultural lands. Of course none of mans early efforts at geoengineering compare to the colossal scale of our latest experiment: that of practically doubling atmospheric CO2 in the last 200 years. 75% of which has been emitted in the last 50 years, in line with our spectacular population growth. I spent the weekend of 3rd November at the Arctic Methane Emergency Group’s workshop on ‘how to cool the Arctic’ with the objective of retaining the sea ice in order to prevent massive methane release and in the hope of re-stabilising the jet stream. (It is the Jet Stream that in the last few years has become increasingly convoluted and led to the extremes of weather now being experienced in the Northern Hemisphere). The premise of this meeting was that we do not have the time or the capability to implement a switch to an all renewable energy paradigm and that even if we did cut out our CO2 emissions entirely, at 400 ppm we have already set the planet up for 3 to 4 C° of warming. Methane hydrates from the defrosting Arctic sea beds are already beginning to enter the atmosphere which will trigger numerous other feedback loops and lead to runaway global warming. Therefore we are going to have to take emergency measures and actively cool the Arctic in order to buy time in which to stabilise and decarbonise the atmosphere. A truly dire situation, but the encouraging part about the meeting was that it would appear that the necessary technologies to manage our climate are within our grasp. Many people shudder at the thought of engineering our climate, but given that we have, initially unwittingly but now knowingly, engineered our way deeper into the situation, we should not be surprised at the need to engineer a correction. So I got to thinking about what climate management could do for us? In fact the more I think on it, the more obvious it is that humanity is going to have to take control of our climate. Firstly to avoid catastrophe and secondly to ensure that the all-renewable energy economy can become a reality, capable of supporting the power needs of 9 billion people, to the same modern standards that we all wish to achieve. It is essential to achieve this without destroying what is left of our natural environment and genetic diversity. Ok it sounds utopian, but it is the future we want, the alternative is an unimaginable horror story. We are capable to of achieving great things; why on Earth would we not? Systems will have to be put in place to manage microclimate change with planning proposals and applications over any changes in river water volume. And special applications will have to be made for desert recovery. With detailed studies into knock on impacts on other areas. Key features of natural cycles will have to be retained, but this does not mean that hurricanes, forest fires, floods and drought cannot be managed. It should be possible to ensure that most rain falls in the morning and evenings, while still maintaining the continuity of seasonal changes. Being able to control the weather means knowing the weather in advance and being able to rely on it. Trade winds blowing consistently will make it possible to power ships by sail and for windmills to turn constantly. It will be even more important for countries that are maintaining rain forests and other large areas of the climate management biosphere, to be compensated by the industrialised and agriculturalised parts of the world for the services they provide. Those services will need to be measured and brought into the dynamics of the new global economy. In order to take control of our climate we first need to fully understand it. This means that our current efforts to monitor the biosphere need to be massively upgraded. 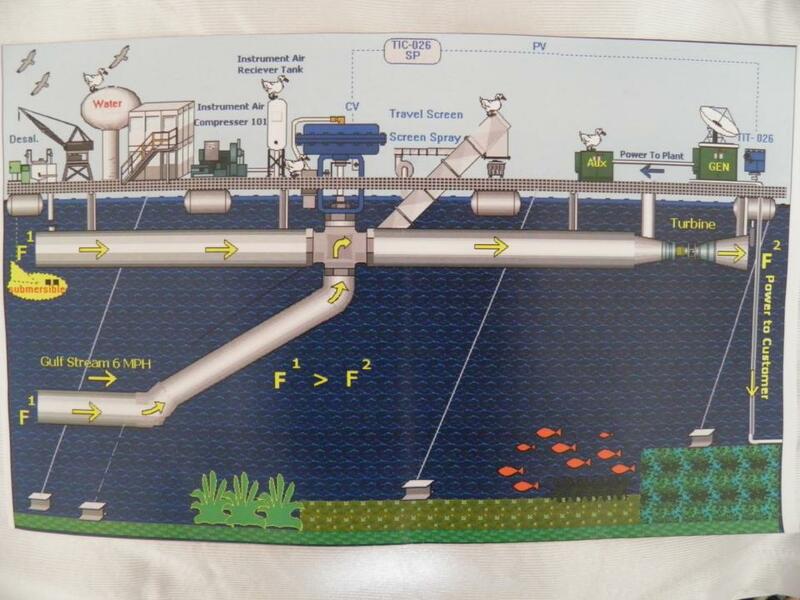 Monitoring systems across the ocean surfaces and depths, on land and in the atmosphere, need to be installed to fully cover the planet. So that every small change can be recorded and its impacts identified. Total management of Earth’s climate will take time. It is something to work towards, although we may have to take emergency measures to cool the Arctic very soon. Small scale tests and research should begin immediately and be given all the funding necessary, so that we can meet the emergency and quickly deliver a fully renewable energy economy. Learning to engineer our climate holds great promises for all life on earth and can make the dream of an all-clean energy future come true. I believe we can and have to do this. Methane is erupting as widespread torches and fountains in the Arctic ocean up to 1 km across and is exponentially increasing in concentration in the Arctic atmosphere (Shakova et al. 2008 and 2010; Light and Carana 2012; Light 2012). The Arctic atmospheric methane is mostly derived from Arctic subsea shelf and slope methane hydrates due to their destabilization by globally warmed Gulf Stream currents which enter the Arctic west of Svalbard and through the Barents Sea. In the North Atlantic, the surface of the Gulf Stream is heated in the summer and is marked by excessive evaporation due to the global warming effects of pollution clouds emanating from North America (Figure 5; IPCC Working Group 1. Fig. 10.12 Lavatus Prodeo, 2012). The exponential increase in Arctic atmospheric methane has caused an exponential decrease in the volume of Arctic sea ice and in the continent wide reflectivity (albedo) of the Greenland ice cap (Light 2012; NASA Mod 10A1 data, from Carana, 2012). The atmospheric Arctic methane which is almost half the density of air is rising like hydrogen into the Stratosphere where it is forming and all encompassing global warming veil further aggravating the global warming of the lower level greenhouse gas clouds. The ice melt back curves from the oldest lower 5* year old ice to the youngest shallowest 2 and 1 year old ice are caused by the progressive increase in temperature of the Gulf Stream “Atlantic Waters” which are entering the Arctic beneath the ice and melting it from the bottom up. The heating of the Gulf Stream waters is directly linked to the global warming of the North Atlantic caused by green house gas pollution blowing east off North America. Above summary diagram (Figure 15, click on image to enlarge) shows all the determined global warming temperature curves and the latest "Sandy" storm surge curve based on a mean storm surge of 14 feet added to the mean latent heat of ice melting curve (Light 2012; Fichetti, 2012). All the global warming curves converge on a region between 2034 and 2052 where the mean atmospheric temperature anomaly will be greater than 8°C and all of the Earth's ice caps will have melted with a consequent sea level rise of 68.3 m (224 feet) above mean sea level (Wales, 2012). In particular the accelerated global warming curve from Carana (2012) and the "Sandy" storm surge curve converge on the mean atmospheric temperature extinction point derived from 20 estimates (Light 2012). This gives great confidence in the interpretation that we can expect catastrophic climate change from methane induced global warming between 2034 and 2052 unless humanity sharply cuts back some 90 to 95% on global greenhouse gas emissions and converts all its energy resources to renewable energy/ nuclear power. Extreme droughts will extend over 1 - 30% of the land area when the atmospheric temperature anomaly exceeds 2°C which will make more than 1.8 billion people water stressed. Widespread coral mortality will occur when the mean atmospheric temperature anomaly is between 2.5°C and 3.5°C and will be associated with a massive increase in the ferocity of tropical cyclones/hurricanes far in excess of the Sandy super storm. Complete deglaciation and coastal inundation is expected when the mean atmospheric temperature anomaly increases from 4 to 8°C with a consequent sea level rise of some 68.3 metres (224 feet) above sea level. There will be major global extinction over this temperature interval as cereal production sharply decreases outside of the tropics. 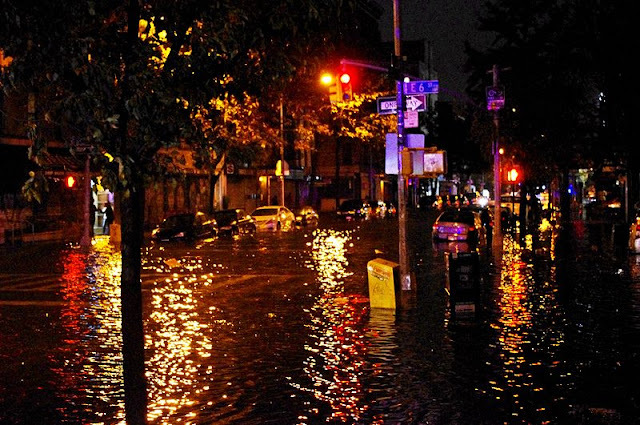 Super storm Sandy has shown that Manhattan is already open to storm surge flooding and by 2016 when the Arctic Ocean begins to be free of ice, we can expect more violent hurricanes bearing down on the eastern coastline of the United States and increasing catastrophic damage to the coastal cities there. If greenhouse gas emissions are not sharply curtailed by 90% to 95% and the Arctic subsea and atmospheric methane extracted and destroyed, mean rising sea levels will breach the Thames Barrier by 2029 flooding London and the proposed Verrazano Narrows barrier in New York by 2030. The base of the Washington Monument (D.C.) will be inundated by 2031. By 2051, total global deglaciation will finally cause the sea level to rise up the lower 35% of the Washington Monument and humanity will have been eliminated by worldwide flooding and firestorms. James Hansen: If it begins to allow the Arctic Ocean to warm up and warm the ocean floor, then we'll begin to release methane [from] hydrates, and if we let that happen, that's a potential tipping points that we don't want to pass. There are now observations that methane is beginning to be released by both melting tundra on the land and bubbling up in the Arctic Ocean, indicating some warming of the Arctic Ocean. 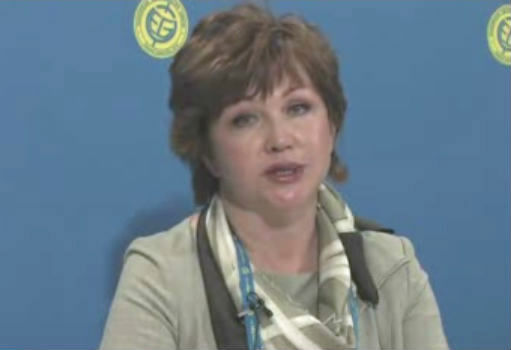 Natalia Shakhova: The total amount of methane in the current atmosphere is about 5 Gt. The amount of carbon preserved in the form of methane in the East Siberian Arctic Shelf is ~ from hundreds to thousands Gt. What divides this methane from the atmosphere is a very shallow water column and a weakening permafrost, which is losing its ability to serve as a seal. This area is very seismically and tectonically active and there was some investigation that the tectonic activity is increasing. 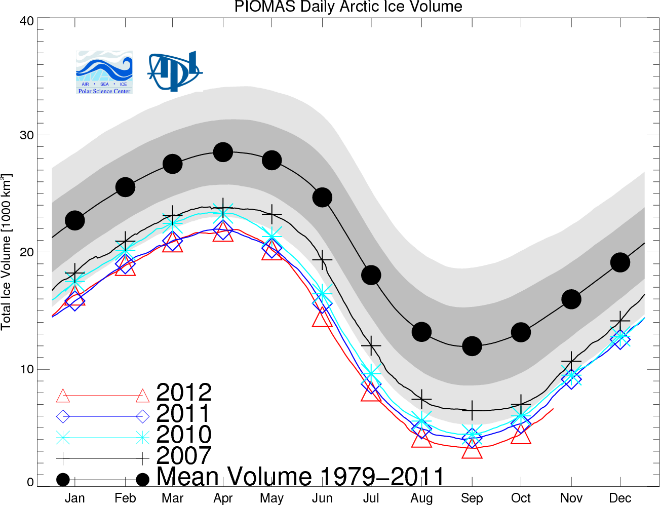 Peter Wadhams: At the rate we're going, it will bring us to an ice-free Arctic in about four years time. [The Arctic Ocean] now warms up to about 5 degrees [5°C or 41°F, i.e.] enough to start warming up the seabed. The seabed at the moment is frozen, but it's now starting to melt. That's allowing a lot of methane which is trapped under the permafrost to be released. That's a large boost to global warming, because methane is an extremely powerful climatically-active gas. David Wasdell: The warm water from the surface is now being mixed down to those areas that it never reached when the whole area was covered in sea ice. As soon as the area is open water, you have a process of heating that goes right down to those clathrate deposits on the seabed. The more the methane is released into the atmosphere, the faster the heating goes. It's probably the greatest threat we face, as a planet. We're already in a mass extinction event. Did Sandy trigger major earthquakes off Vancouver? 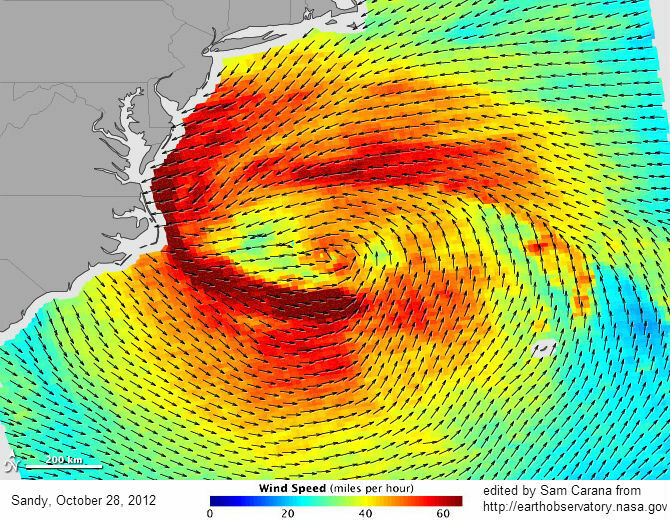 The NASA image below gives an impression of the strengtrh of hurricane Sandy, as it approached the U.S. coast on October 28, 2012.
showing the strength and direction of Sandy’s ocean surface winds on October 28, 2012. The animation below was created by Alex Hutko, a seismologist at the Incorporated Research Institutions for Seismology (IRIS) in Seattle. 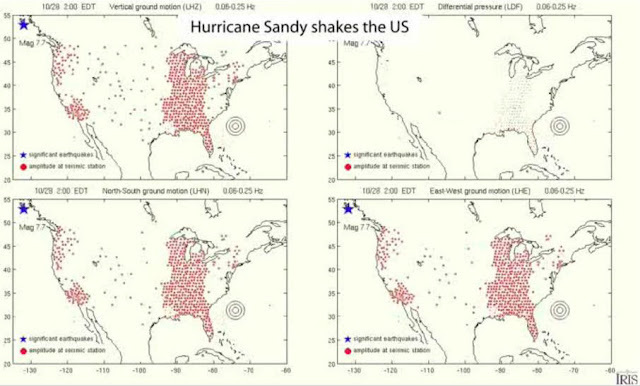 It shows how seismic stations lit up as hurricane Sandy continued its path. 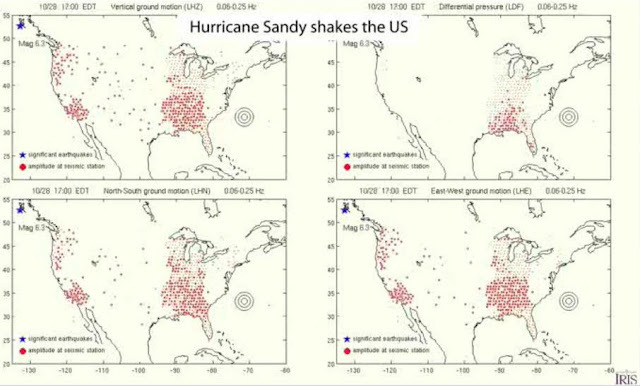 The images below are screenshots from the animation, showing how three eathquakes hit the coast off British Columbia in Canada, coinciding with large tremors caused by Sandy. A 7.7 magnitude earthquake (image below) hit the coast off Vancouver on October 28, 2012, at around 2:00 EDT. The USGS later upgraded the earthuake to magnitude 7.8 and gave the time as 3:04 UTC. A 6.3 earthquake below hit the area the same day (October 28, 2012) at 17:00 EDT (USGS: 18:54 UTC). A 6.2 earthquake (image below) followed on October 30, 2012. 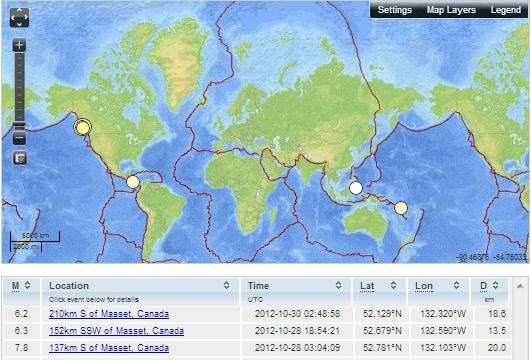 The USGS image below gives further time and location details of these earthquakes using UTC time. There were more earthquakes than that. At the USGS site, I counted 90 further earthquakes in the area with a magnitude of at least 4 that occurred within days of the first earthquake. Paul Beckwith, regular contributor to this blog, gives the following comments on the question whether Sandy was the trigger for major earthquakes off Vancouver. “Sandy was a massive storm, packing an enormous amount of energy. According to Jeff Master's Wunderground blog, she carried the energy equivalent of five Hiroshima sized nuclear bombs. As she approached the eastern seaboard of the United States she was detected on the seismic stations in the U.S. As she moved her large size (tropical storm winds within a 900 mile diameter) and extremely low pressure center (940 mb usually indicative of Category 3 or even 4 magnitude hurricanes), she sucked enormous quantities of ocean water upward. Clearly, this adds tremendous stresses onto the earths crust and pushes it downward; this was reflected in the seismic stations. The animation of her progress shows the ground stresses across North America between October 14th and November 1st. On her northward jaunt up the eastern coast the seismic strain lit up to a peak and there was a 7.8 magnitude earthquake (Oct 28th, 3:04 UTC) off Vancouver, as shown in the first image. As she continued northward and just before her extremely unusual left turn (due to extreme waviness of Rossby wave jet streams leading to continental low and northward tilted blocking high), there was another maximum of red seismic activity and a 6.3 magnitude aftershock (October 28, 18:54 UTC). Then she turned left and as she crossed the coastline just south of NYC there was a second large aftershock of 6.2 magnitude (October 30, 2:38 UTC). Again, this aftershock coincided with large seismic activity indicated in red on the east coast. In conclusion, there is a danger that storms and cyclones trigger submarine earthquakes, which can in turn cause shockwaves and landslides over a wide area, destabilizing hydrates and triggering massive releases of methane in the process. As the sea ice disappears, the Arctic Ocean increasingly features open waters which are more prone to cyclones. Total Arctic sea ice volume from PIOMAS showing the volume of the mean annual cycle. Below, the average monthly volume data over the years with exponential trends added by Wipneus, incorporating the data for November 2012. 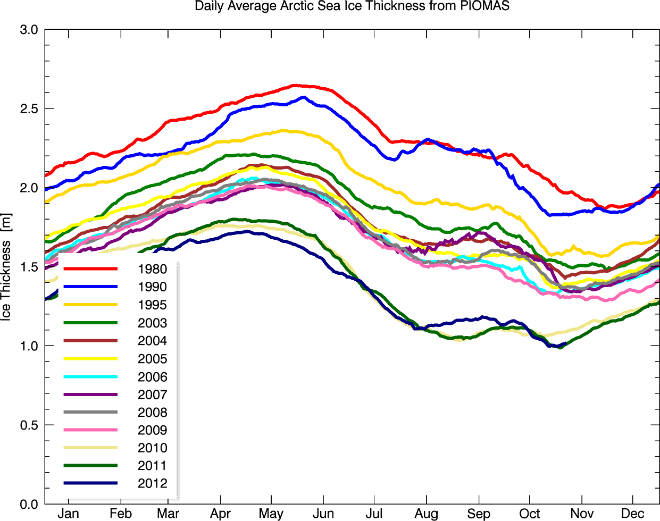 In November 2012, the average Arctic sea ice thickness over ice-covered regions fell below one meter, as illustrated by the image below. 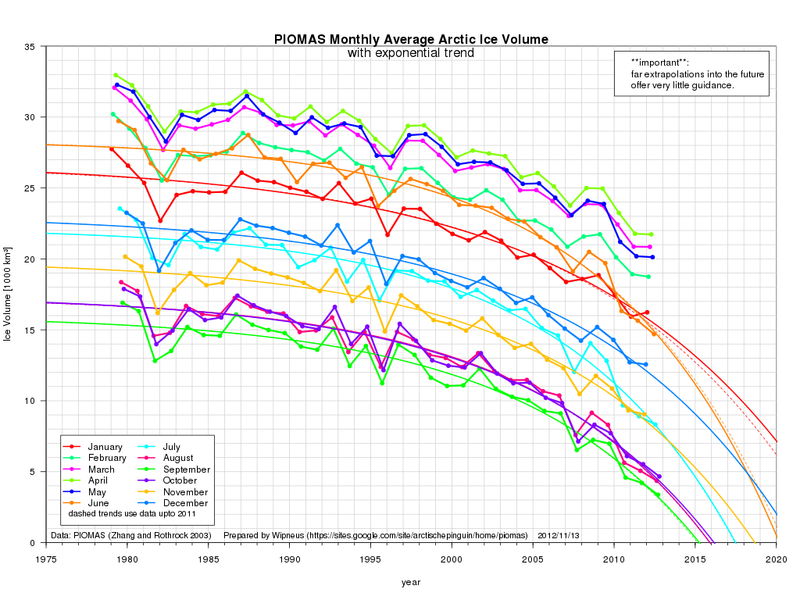 Average Arctic sea ice thickness over the ice-covered regions from PIOMAS for a selection of years. 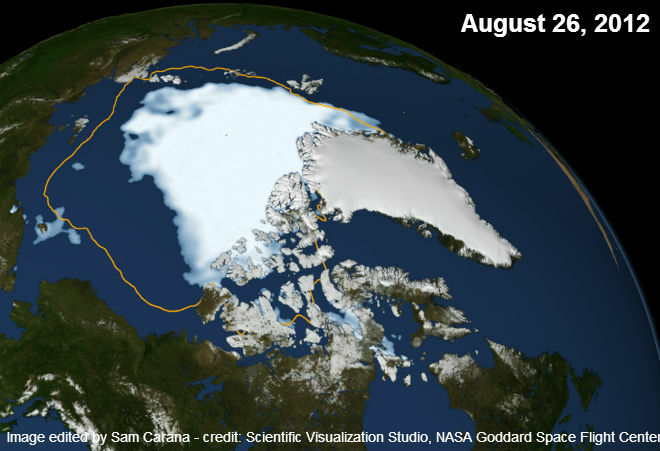 As the sea ice gets thinner, the risk increases that the ice will break up. More open water makes the Arctic Ocean more prone to storms and associated feedbacks that can be expected to speed up such break up. Furthermore, they can push much of the ice into the Atlantic Ocean, leaving little ice in the Arctic Ocean to reflect sunlight back into space and to act as a buffer when temperatures start rising again the following year. For more on such feedbacks, see the post Diagram of Doom. 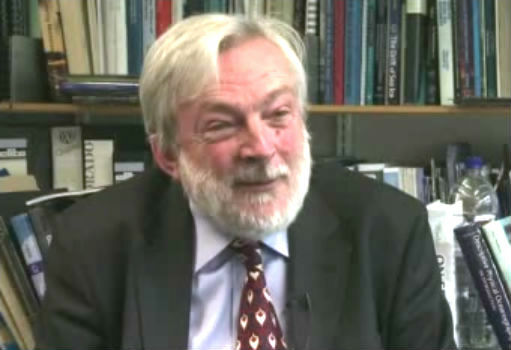 Professor Peter Wadhams warns in an article in Scientific American that the rate at which summer melting is outstripping accumulation of new ice in winter makes the entire ice cover likely to collapse by 2015. Less ice means that less sunlight will be reflected back into space; as a result, warming in the Arctic will accelerate dramatically. Because a third of the Arctic Ocean is composed of shallow shelf seas, surface warming will extend to the seabed, melt offshore permafrost and trigger the release of methane, which has a much greater greenhouse warming effect than CO2. A Russian-U.S. expedition led by Igor Semiletov has recently observed more than 200 sites off the coast of Siberia where methane is welling up from the seabed. Atmospheric measurements also show that methane levels are rising, most likely largely from Arctic emissions. To avoid the consequences of a collapse of summer ice, we need to bring back the ice we have lost. That will require more than merely slowing the pace of warming—we need to reverse it, Professor Wadhams adds. In a move giving hope to environmentalists, climatologists, scientists and humanity, President Obama mentioned climate change in his acceptance speech last night after winning his bid for re-election. 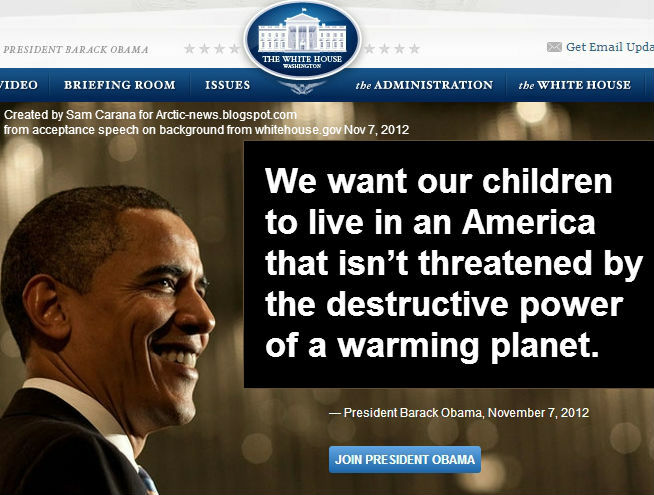 Despite all the threats that America faces, Obama zeroed in on climate change. Although climate change was not mentioned once in the candidate’s debates between Romney and Obama, clearly our warming climate is on the President’s mind. After Hurricane Sandy hit the East Coast and cost lives and billions of dollars in damage, the subject of climate change has repeatedly been brought up, and the tide of public opinion on global warming has shifted – with over 70% of the U.S. now believing that climate change is real. Days before the election and in the aftermath of Hurricane Sandy, the subject of climate change also shifted the thoughts of some on who to vote for in the election. Although the debates featured both candidates speaking of drilling for oil, it looks like the President’s agenda will be to continue focusing on clean energy, sustainability and green issues. Although there were some failed attempts to implement Obama's policies in his first term, we can be sure to expect the continuation of working towards a more sustainable future in the next 4 years. When elected in 2008, President Obama had high hopes for addressing climate change, but with the focus then on saving the faltering economy, bailing out the banks and a corrupted Wall Street system, attention was diverted away from the subject. Despite the threat of an economic meltdown when Obama first took office, there was still a major push towards creating green companies, researching alternative energy sources and a focus on green energy jobs. Although the President faced opposition from many Republican leaders who didn't believe in climate change, the tide of public opinion and the necessity to address climate change has many people concerned. With extreme weather on the rise and costing lives and billions of dollars in damage, people are also waking up to the growing threat of a catastrophic release of methane gas from the rapidly thawing Arctic. Methane gas is many times more powerful than carbon dioxide, and has the ability to send the Earth into runaway and/or abrupt climate change. Written in September of 2012, before Hurricane Sandy hit, Nissen's plea seems to hold many truths as we stand witness to the devastating damage from an unprecedented storm dubbed “Frankenstorm”. With a need to put more pressure on global leaders to address the growing threat of climate change, more action is needed to act fast and act quickly. Climatologists and scientists say the window of opportunity is rapidly closing. With Obama's words on climate change during his acceptance speech, a tiny flicker of hope has been stirred that maybe, just maybe, something can be done to avert a climate change mega-disaster. And with the Pentagon stating that climate change is the number #1 threat to national security, perhaps a global consensus surpassing partisanship can take place – with saving humanity as the ultimate goal. After all, the economy won’t matter if there are no people left to have jobs. Although recent polls show that 70% of people now believe in climate change, recent extreme weather events are sure to drive that number even higher. With the East Coast of the U.S. reeling from the extreme devastation of Hurricane Sandy, attention has been brought back to what caused the Superstorm and why. Many in the scientific community point to climate change as being a major contributing factor in the unprecedented storm. Although some die-hard climate skeptics say that Hurricane Sandy was not caused or fueled by climate change, that minority seems to be losing ground as evidence piles up in favor of those that believe that extreme weather events are being caused by a warming climate. In a sampling of Americans, there are some interesting views and comments being made about climate change and its effects on the globe. Many that Diaz interviewed agree with Doug, that the Earth is now showing us the consequences of not tackling climate change earlier on. 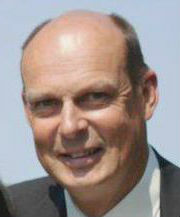 Patrick McNulty, another AMEG member, has some ideas for tackling the problem that climate change is bringing us. Patrick’s tunnel idea for dealing with the effects of Arctic ice melting are one of the many “solutions” that are being examined in the response to battling the effects of climate change. Changing the way we consume fossil fuels is being tackled by other inventive people including an idea that includes the use of “bio-fuel”. One manufacturer of this bio-fuel cites that there would be less impact on our environment, one way to slow down human’s contribution to the problem of our warming climate. Mead Rose, who has also been following the climate change debate for several years, closely follows the melting of the Arctic ice and it’s ramifications. In one of the articles that Mead submitted, the evidence of climate suppression is exposed. In an 2009 article named, “Group Promoting Climate Skepticism has Extensive Ties to Exxon-Mobil”, evidence makes it clear that there has been an ongoing battle by Big Oil companies to discredit scientific evidence about climate change. With the battle over climate change continuing, climate skeptics and disinformation concerns climate scientists who have been trying to warn of catastrophic consequences if we don’t address it now. One well know climate scientist, Michael Mann, a Penn State University scientist who has been studying the climate for decades, said that ocean waters were about 1 degree warmer thanks to man-made climate change, one factor that clearly caused Sandy to swell. 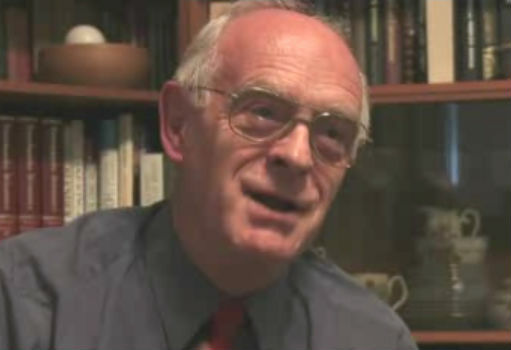 Mann, author of “The Hockey Stick and the Climate Wars”, has been an outspoken critic on the debate over climate change. Politicians, who used to shy away from the discussion of climate change, are even starting to “come clean” about what’s happening to our climate. With an estimated 3 foot rise in California’s sea level expected by 2100, California Governor Jerry Brown is pulling no punches in dealing with climate change deniers. EQECAT, a consultancy based in Oakland, California, estimates the economic losses from Hurricane Sandy at between $30 billion and $50 billion in economic losses, including property damage, lost business and extra living expenses. The question is now, how much longer can we afford to debate about climate change? The Arctic Sea Ice is Melting: What Does This Mean For Us? Frankenstorm Sandy is a scary beast. A hybridization between a tropical hurricane and a mid-latitude cyclone, her behavior is not natural at all. Moving northward off the east coast, Sandy is turning left toward land instead of right toward the sea. Sandy’s being blocked from moving north by a high pressure area of enormous magnitude, and being sucked west by a low pressure region of very exceptional (and highly unusual) strength. Because the Earth rotates on its axis, circulating air deflects toward the left in the Southern Hemisphere and to the right in the Northern Hemisphere. This deflection is called the Coriolis Effect and explains why storms in the northern hemisphere generally always turn to the right. Sandy should be turning right. 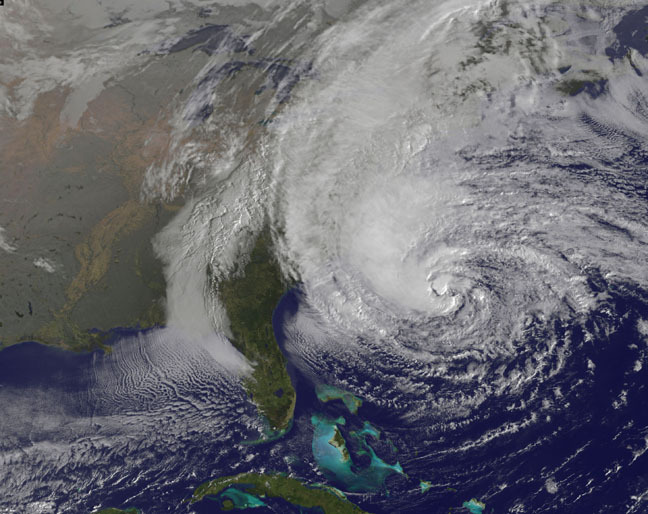 So why is Sandy turning left towards the U.S. east coast? That’s where meteorology comes in - and the meteorology is now a lot different thanks to climate change. How so? As I wrote in my last blog, push something and it moves a little … push it a little more and it moves a little more. This is called a “linearity” response. But sometimes a little push can lead to something totally unexpected! This is called “nonlinearity” and, contrary to what one might think, nonlinearities are inherent in most systems - like our atmosphere. Until recently, our atmosphere and oceans behaved like linear systems: incremental dumping of greenhouse gases into the atmosphere caused incremental changes, like rising temperatures and predictable rates of ice melt. But things are now changing unexpectedly fast – nonlinearity is kicking in! Make no mistake about it, Frankenstorm Sandy IS a nonlinearity event; totally unpredicted and totally unprecedented - the latest example of global weirding. For the first time in at least 3 million years, the Arctic icecap will soon completely disappear. Without it, sunlight that would normally reflect back out to space will be absorbed by the water - warming it and the air above it. The old climate models predicted the Arctic Ocean wouldn't be ice-free for 30 years or more, but now we know it could be gone in as little as 3 years (and no more than 7). When this happens, the temperature differential (between the Northern and Southern hemispheres) will be reduced even further, and in short time. NASA image with data from the U.S. Defense Meteorological Satellite Program’s Special Sensor Microwave/Imager. The line on the image shows the average minimum extent from the period covering 1979-2010, as measured by satellites. Meteorology 101 shows us this change (reduction) in the temperature differential slows west-to-east winds and jet streams. And as fast jet streams slow, they become much wavier and travel much more north and south (this is contributing to the large high pressure area we are seeing directly north of Hurricane Sandy and large low pressure area over the United States). If you think this storm is bad, get used to it. Frakenstorms like Sandy will become commonplace, the new norm, as it were. As I write this blog for Sierra Club Canada, Frankenstorm Sandy maintains (and may even be gaining) strength as she approaches the U.S. coast. She’s expanded in size so much that gale force winds are now covering an area over 1500 km in diameter. Sandy is now the largest hurricane ever recorded in the Atlantic basin. Her winds have reached 150 kilometers per hour and her barometric pressure has dropped to 940 millibars (among the lowest pressure ever measured anywhere in the continental United States). As I’ve been predicting in my blog since August, hold on folks… the times they are a-changin’. NOAA's GOES-13 satellite captured this image of Hurricane Sandy on Oct. 28 at 1302 UTC (9:02 a.m. EDT). The line of clouds from the Gulf of Mexico north are associated with the cold front that Sandy is merging with. Superstorm Sandy hit North America's east coast in a devastating way. This justifies an analysis of the forces behind Sandy and the links with global warming and climate change. Global warming causes temperatures of oceans and the atmosphere to rise. A warming Gulf Stream fuels hurricanes traveling north along North America's east coast. 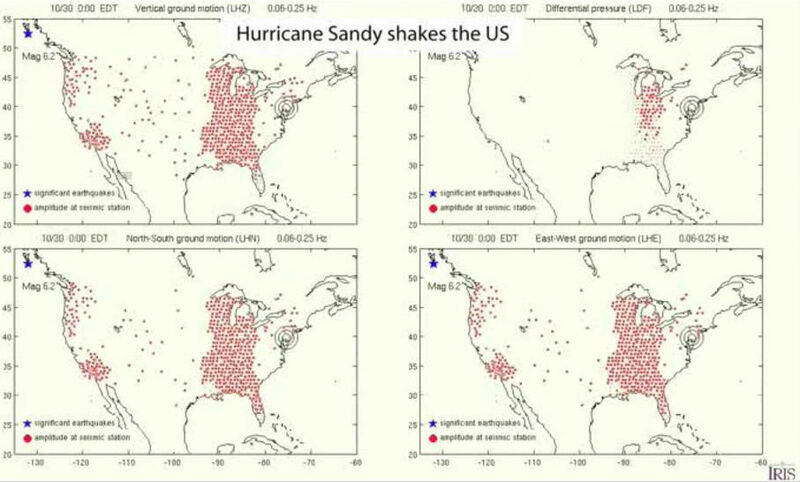 More heat translates into more wind; specifically, stronger hurricanes are getting stronger over the years, as illustrated by the inmage on the right from James Elsner et al. (2008). Additionally, sea levels are rising, especially on the Atlantic coast of North America, which is a hotspot of accelerated sea-level rise, as described in a study by Sallenger et al. (2012). 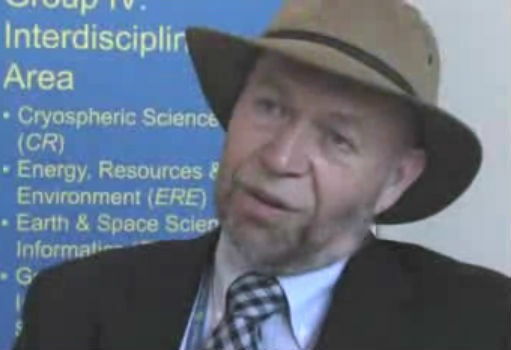 Generally, global warming will cause more extreme weather events, says James Hansen (2012). This is especially the case for heavy rainfall events, since global warming causes more evaporation of seawater, while warm air can also carry more water. According to Kevin Trenberth (2011), the water holding capacity of air increases by about 7% per 1°C warming, which leads to increased water vapor in the atmosphere. Hence, storms, whether individual thunderstorms, extratropical rain or snow storms, or tropical cyclones, supplied with increased moisture, produce more intense precipitation events. All this leads to a greater hurricane danger; they can be expected to be stronger and wetter, causing flooding and further devastation along the east coast of North America. The situation in the Arctic is making things even worse. Several studies, such as by Jennifer Francis (2012), by Greene et al. (2012) and by Liu et al. (2012), show that atmospheric circulation is changing as a result of sea ice loss. This circulation change results in more frequent episodes of blocking patterns that lead to increased cold surges over large parts of northern continents. Moreover, sea ice loss results in an increase in atmospheric water vapor content in the Arctic region during late autumn, and this provides enhanced moisture sources. More open water in the Arctic Ocean results in more warming of the overlying atmosphere. This warming can be expected to change precipitation. An analysis by Julienne Stroeve (2011) shows an autumn increase in cyclone-associated precipitation over the past decade, linked to a shift in atmospheric circulation towards more frequent and more intense cyclones in the Atlantic sector of the Arctic. The authors added that more research was needed; indeed, the devastation caused by Sandy calls for further analysis. Warming in the Arctic is accelerating at a pace several times that of the rest of the world, as a result of multiple feedbacks as described in the post Diagram of Doom; changing of the jet stream is only one out of multiple feedbacks. Changes to the jet stream were behind Sandy's path inland. A strong and prolonged high pressure area over Greenland blocked Sandy from going north or east. This also caused it to spread out and to hang around for such a long time. Big changes are taking place in the Arctic, in terms of sea ice loss, snow line retreat and albedo change in Greenland. Without more effective action on climate change, weather events like this can therefore be expected to hit the east coast of North America more often and with increasing force in future.